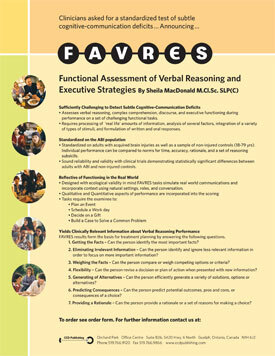 Assesses verbal reasoning, complex comprehension, discourse, and executive functioning during performance on a set of challenging functional tasks. Requires processing of ‘real life’ amounts of information, analysis of several factors, integration of a variety of types of stimuli, and formulation of written and oral responses. Standardized on adults with acquired brain injuries as well as a sample of non-injured controls (18-79 yrs). Individual performance can be compared to norms for time, accuracy, rationale, and a set of reasoning subskills. Sound reliability and validity with clinical trials demonstrating statistically significant differences between adults with ABI and non-injured controls. Designed with ecological validity in mind FAVRES tasks simulate real world communications and incorporate context using natural settings, roles, and conversation. FAVRES results form the basis for treatment planning by answering the following questions. Getting the Facts – Can the person identify the most important facts? Eliminating Irrelevant Information – Can the person identify and ignore less relevant information in order to focus on more important information? Weighing the Facts – Can the person compare or weigh competing options or criteria? Flexibility – Can the person revise a decision or plan of action when presented with new information? Generating of Alternatives – Can the person efficiently generate a variety of solutions, options or alternatives? Predicting Consequences – Can the person predict potential outcomes, pros and cons, or consequences of a choice? Providing a Rationale – Can the person provide a rationale or a set of reasons for making a choice? Administration Time: Approx. 60 minutes: 15 minutes per task. lndividual times vary.